A rendering of the Woodruff Commons, a three-space suite that can be opened in a single room for events. Image credit: Collins Cooper Carusi Architects. The major renovation of Robert W. Woodruff Library Level 10 for the Manuscript, Archives, and Rare Book Library (MARBL) is on track for completion by the beginning of fall semester. The construction fencing around the library plaza will be removed in time for Emory University’s commencement on May 11 to ease pedestrian access to Goizueta Business School and the Fishburne parking deck. Construction began immediately after commencement in 2014, and the MARBL staff is looking forward to the debut of the new space. "We are eager to invite our students and faculty and the broader community to experience the beauty of the space along with the richness of our collections," says MARBL director Rosemary Magee. ● Late April: Fencing around the plaza will be removed. The construction hoist was taken down April 27. ● Early May: Plaza to reopen to pedestrian traffic. ● Mid-May: MARBL staff slated to move back to Level 9, which was renovated in 2013 for staff offices and acquisition processing. Due to the impact from Level 10 renovation, staff members were temporarily relocated to other areas of the library. ● August: Construction scheduled for completion; MARBL to move back in to Level 10 in time for the fall semester for teaching and research use. Opening events will be planned in the months following to celebrate the project’s completion. MARBL will continue to operate on Level 7 of the Woodruff Library throughout the summer. Check the MARBL hours page for more information. Most of the major renovation is completed, with the interior finishes underway, Forrest says. The large windows, filling the arches of the former balcony, have been installed. All interior walls are in place, giving the space definition. 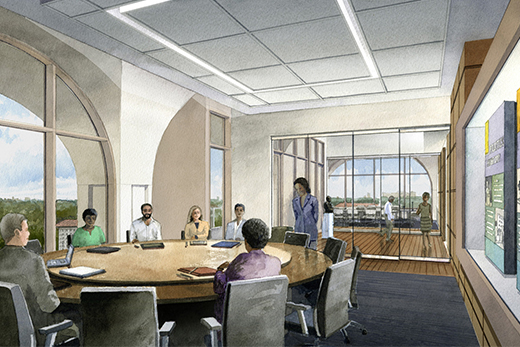 Woodruff Commons, previously the Woodruff Room, will be a suite of three spaces — a technology-equipped conference room with a round table to seat 14; a scholar’s commons with comfortable seating; and a vestibule between them that leads to a balcony on the west side facing downtown. Movable glass partitions define the three spaces but can also be folded to open up the combined rooms for special events. The expansion onto roughly 80 percent of the previous wraparound balcony allowed MARBL to capture an additional 4,300 square feet for the interior, yet retain the panoramic views through the huge arched windows, Forrest says. "We’re creating a special space for the presentation and use of our special collections," Forrest says. "The tenth floor will be a beautiful space with enhanced functionality, much better able to support MARBL’s teaching, research and public programs."